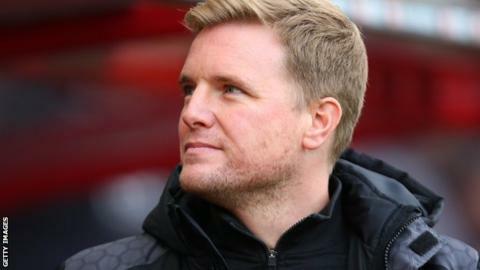 Bournemouth manager Eddie Howe hopes more of his squad will sign longer-term deals to keep their mentality strong. Defender Simon Francis committed his future to the Premier League club by signing a new three-and-a-half year deal on Wednesday. Howe wants more to follow Francis' lead in the months ahead as the Cherries press for top flight survival. "I've always said one of the biggest challenges is to keep hold of the squad we have," Howe told BBC Radio Solent. "I'm delighted Simon is the first to commit to the club and hopefully more will follow. "We've a really good mentality in the squad. That's down to the players being good characters and being moulded to what we do. "That's crucial to our long-term success and once we add players, it's easier for them to adjust to the mindset that's already here in the main core of the group." Following the departure of striker Yann Kermorgant to Reading and the release of defender Elliott Ward to Blackburn, Howe denied more players would leave before the end of the January transfer window. "I'm not trying to push people out," he replied. "But, you do have to readdress the balance slightly when you bring players in. "If there's not a route for someone to get in the team, it may be better for them to move elsewhere."